Extremadura Fishing, Pleasure Angling Extremadura. Spain. "A bite a Chuck" is the norm to all methods including waggler, bomb and feeder. There are 4 lakes on our doorstep that offer a variation of Pleasure Fishing. Choose your style of fishing and target species for the day, bag up on lively Barbel or take advantage of the cracking Crucian Carp that average over 3lb. These lakes contain a huge stock of "net fish" with Tench, Barbel, Carp, Bogga and Crucians. Barbel in the 2-4lb bracket provide great sport on waggler, catches of over 40lb Barbel a session is a regular event. Largest nets weighed by guests to date are 98lb of Barbel and 269lb of Crucian and Carp both taken to waggler tactics. Accommodation in a typical Spanish 'Casa Rural' All rooms have TV, heating/air-con, free wifi, there is an open fire livingroom and even a terrace BBQ area. A continental buffet breakfast is also included in the package price. Click here to visit the accommodation website. Transport to lake in 4x4 Vehicles. **All necessary equipment except for end tackle and reels. Based on 2 anglers, discounts are available for groups of 3 and above. Prices inEUROS and are subject to availability. Extrema Fishing Spain uses the vast experience of Fishing Guide Craig Reid. Craig 50 has been successfully involved in guided fishing on Spanish waters now for over 15 years, originally on the River Ebro before relocating to Extremadura over 12 years ago. 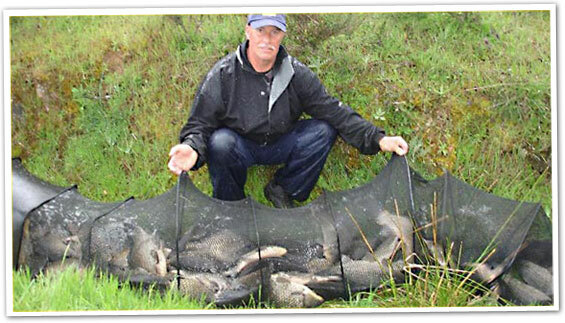 He has fished from a young age and pursued Specimen Carp and Barbel for over 30 Years. Website designed for resolutions of 1024x768 px. or higher. Design by AGD Inform�tica.